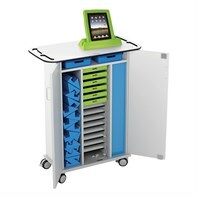 The Big Grips Charging and Syncing Trolley is specifically designed to fit 15 Big Grips Frames with iPads inside and store 15 Big Grips Stands. Buy 15 Big Grips Frames and Stands together with a trolley and save 5% – phone us to place your order! Fits Big Grips Frames for iPad 2/3/4 or for Air/Air 2! Delivery lead time is currently 6 to 8 weeks. 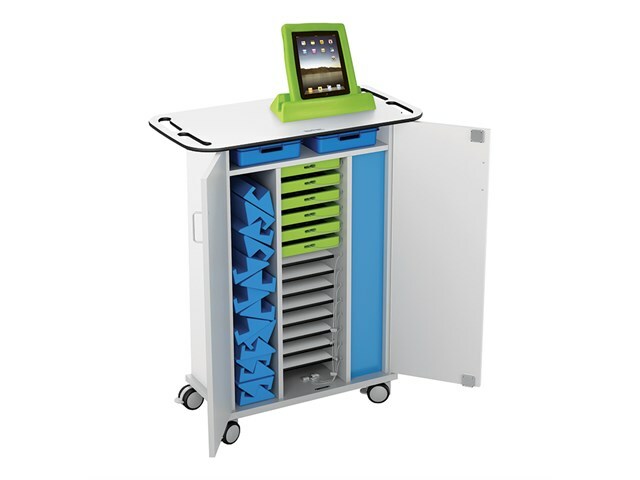 The Big Grips Trolley provides charging, syncing and secure storage for 15 iPads inside Big Grips Frames and includes storage space for 15 Big Grips Stands, plus 2 A4 size trays at the top for your iPad accessories. Choose between two trolley options: charging only and charging plus syncing. Handle cut outs to help you steer if you want to move it. Lockable doors and on lockable castors. Doors fold back 270 degrees for easy access. Two A4 size storage trays for your iPad accessories. Delivery charge per trolley is £60. Unfortunately we can only offer doorstep delivery on this product. Two years warranty as standard. 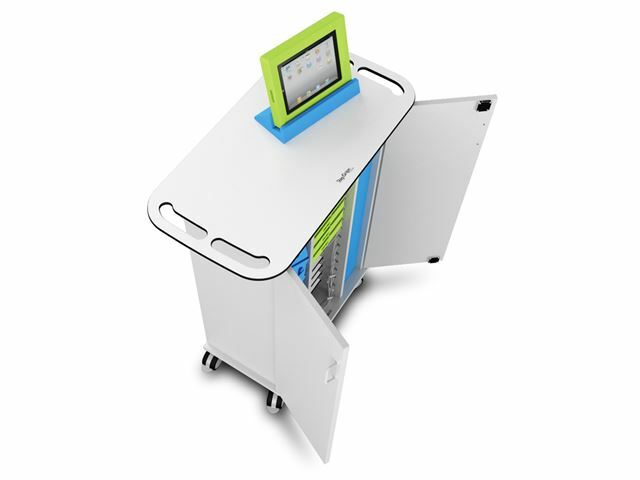 Colour: White laminate trolley/blue trays and interior. Overall Dimensions: 87cm(W) x 46cm(D) x 109cm(H). Shelf Slot Dimensions: 27cm(W) x 34cm(D) x 4.6cm(H). Top shelf is 9cm(H) and can be used to store a laptop rather than a tray. Power: Requires 1 x external power socket (individual iPad mains chargers and USB cables not included). The trolley weighs 60kg without any packaging. Intelligent charge and sync technology detects each connected device and determines the optimum charge settings - so each iPad will charge just as fast as if it were plugged directly into a wall socket. Sync connection to a host laptop or PC is enabled by connecting a USB cable (supplied). Laptop can be closed, housed and locked within the trolley during sync using a Third Party power management app (not included). Please note: iPads are not included. Delivery charge per trolley is £60. Although we cannot guarantee the safety of your iPad, we do provide two years warranty as standard on the trolley. This product has a 28 days returns policy.